The Skinny: The Muscles from Brussels fails to totally ruin John Woo's American film debut. Hard Target is a stupid but entertaining B-film with fun over-the-top action and very little actual substance. This is crap, but not without its amusing moments. John Woo's first US effort is pretty good  for a Jean-Claude Van Damme film. The Muscles from Brussels plays a Cajun drifter named Chance, who becomes a target for rich hunters who hunt humans for sport (a la "The Most Dangerous Game"). He gets drawn into the mess when token female Yancy Butler hires him to find her missing dad. Lance Henrikson is the cool bad guy who runs the whole show and Arnold Vosloo is his equally charismatic right-hand man. Also starring Quaker Oats guy Wilford Brimley as Chance's uncle, who makes moonshine and looks damn ridiculous riding a horse. Kicks and explosions ensue, as does a healthy helping of slow motion. Notes:  John Woo was famously locked out of the editing room because his cut of the film baffled the studio execs, who were probably expecting Kickboxer 2. The "Director's Cut" of Hard Target is reportedly twenty minutes longer, and is readily available at the bootleg tables of your friendly neighborhood sci-fi convention. 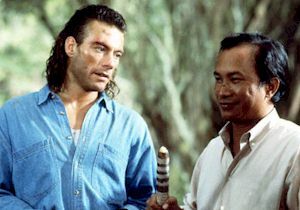 Awards:  Reportedly, Hard Target won the title of "Greatest Film Ever Made." However, the venue and actual decision-making body of that award are both total mysteries.